UPDATED: Mon., Jan. 1, 2018, 8:14 p.m. The Lions and Bears showed their coaches the door. 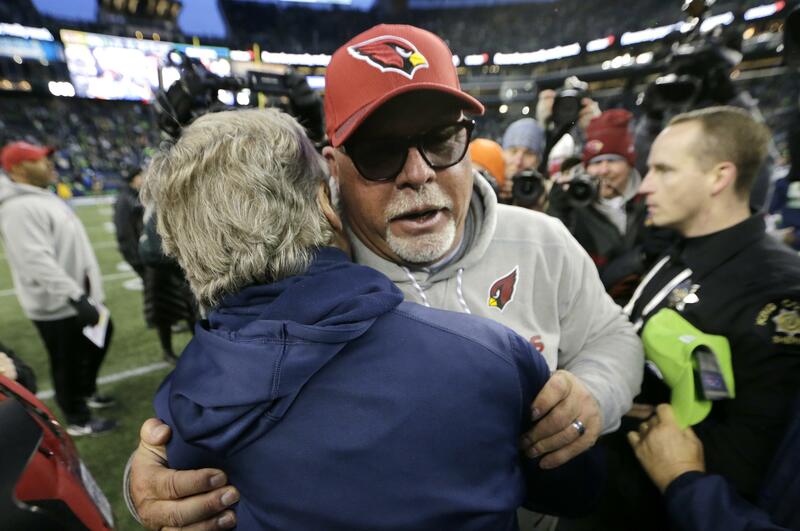 Bruce Arians of the Cardinals found it himself. And Vance Joseph of the Broncos remained gainfully employed despite enduring the sort of season that doesn’t go down well in Denver. What is traditionally the NFL’s biggest day for firings, “Black Monday,” started with a flurry when Detroit canned Jim Caldwell and Chicago did the same to John Fox, both before noon. “Today is the tough part of our results-oriented business,” said Fox, whose team went 14-34 and finished last in all three of his seasons in Chicago. He and Caldwell, who went 36-28 in four seasons but didn’t win a playoff game, joined Jack Del Rio of the Raiders and Chuck Pagano of the Colts, whose owners didn’t even wait until the calendar turned, choosing to sack them after their games Sunday. Arians, who has been dealing with health problems, including a bout with kidney cancer, announced he was leaving Arizona, though that was widely expected. In a teary news conference, the 65-year-old Arians called his stay in Arizona, which included 49 victories over five seasons “a great ride.” Sporting his trademark cap and toying with his grey goatee, Arians said an eye opener came over the summer when his wife told him his son, Jake, was soon to turn 40. Joseph, a rookie head coach who oversaw a 5-11 season that included an eight-game losing streak, was on the hot seat. But his boss, John Elway, slept on it and decided to keep Joseph and not begin a search for the team’s fourth coach in five years. The Marvin Lewis situation in Cincinnati – well, it’s complicated. Lewis completed his 15th season with the Bengals, and conventional wisdom held that he might not be asked to return. He met with owner Mike Brown on Monday, but no conclusions were reached. Lewis said the decision was more complicated than management simply asking him back, and that the owner and the front office need to be on the same page. The five vacancies (six counting the Giants, who fired Bob McAdoo earlier in December) naturally triggered a flurry of speculation about which assistant coaches might be moving on to take over the teams. Panthers defensive coordinator Steve Wilks confirmed that the Colts, Lions and Giants had asked him to interview. Patriots coordinators Josh McDaniels and Matt Patricia were, as usual, on a number of lists, and Eagles defensive coordinator Jim Schwartz was considered one of New York’s top candidates. Maybe most intriguing was the prospect of Jon Gruden leaving the broadcasting booth and returning to the Raiders. ESPN reported that Raiders owner Mark Davis was trying to lure Gruden back to the sideline with an offer that could include an ownership stake. In Houston, Texans general manager Rick Smith said he would leave the team for at least a year while his wife, Tiffany, fights breast cancer. There had been speculation that coach Bill O’Brien might lose his job, though it appeared O’Brien would stay on. Smith dismissed the notion that he and O’Brien don’t get along, saying they have a great working relationship. “We continue to do that and that’s another reason why this is a decision that I can make,” Smith said. Published: Jan. 1, 2018, 7:37 p.m. Updated: Jan. 1, 2018, 8:14 p.m.